Here's the finished product. Couple of issues with the paint here and there. Truckbed liner on the nose where the BB slides didn't work out quite right, and I dinged it here and there on the steering gear during reassembly. But no biggie. Looks great. Went with the traditional "Warrior Orange". Actually Kubota tractor paint. Goes on shiny and is hard as nails. OK! Here we go! I have been building and riding a Street Fox for 2 years now and loving every minute of it (mostly). I have put an Amped Bike hub motor and got nearly 60 miles today on a charge. Peddling all the way but adding the electric in to keep comfortable. 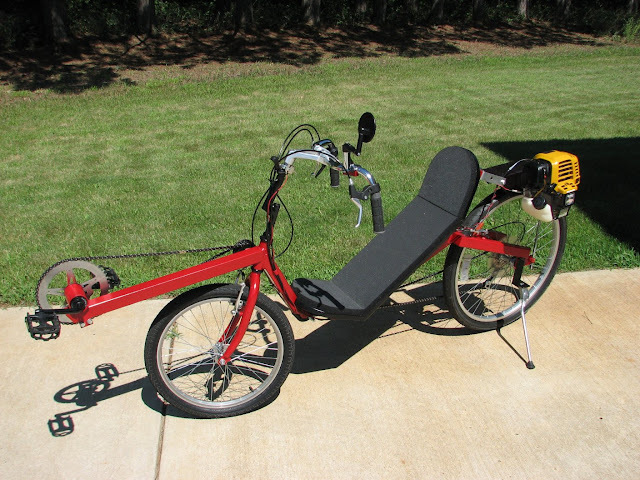 The StreetFox Recumbent Tadpole Trike is a fast and comfortable version of the classic "tadpole" style trike (two wheels in the front), which includes rear suspension, three wheel braking, and 26 inch rear wheel for optimal gear range. Because this project only requires a basic welder, an angle grinder and a hand drill, the StreetFox can be built by anyone with the desire to put a little effort into this rewarding hobby. Because of the simple mono tube main frame, the StreetFox is highly customizable, allowing the builder to alter the plan to suit his or her own needs, or simply to try new ideas. The most complex part of the trike is obviously the steering, but the StreetFox uses commonly available and "bullet proof" BMX wheels and hubs, so you don't need to source hard-to-find, expensive front wheel parts. All three wheels have standard bicycle brakes and cables as well, so you can find most of your parts by salvaging old bicycles or at most bicycle stores.The StreetFox looks and handles as good as any commercially produced trike, and can be completely made using commonly available and inexpensive bicycle components and some square tubing. Not one single machined part is needed. 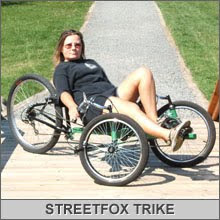 The StreetFox has an adjustable bottom bracket so it can fit riders of most heights, from 5 feet to well over 6 feet tall. Due to the rugged construction and use of sturdy 14 mm axle, 48 spoke front wheels, the StreetFox can easily accommodate riders over 250 pounds.
" Finally I stopped just planning and started my first diy-project. Actually I count it as welding practise, but the project is about to produce a HighRoller. It has been a great therapy for me to build the bike and I have enjoyed it so much. Of course there has been quite a lot of trials, errors and fixes but I'm quite happy with the outcome so far." Until September 1, 2010. Time is running out! This really is a cool bike project! $3.49 DIY plans - only two days left! We're feeling a bit wiggy lately due to the heat. It's been so hot and humid, it's literally driving us insane! But, the temperatures have been cooling off this past week, so this temporary insanity won't last long. So, please feel free to take advantage of our crazy state of mind. This is a limited time only. Yep, you're reading the ad right. That's 20 DIY plans of your choice for only $69.80, that works out to $3.49 plan! 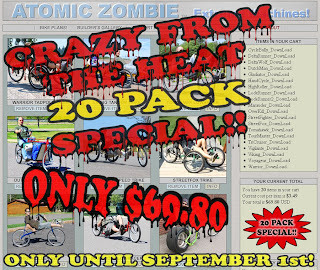 This amazing offer ends Sept. 1, 2010 and might not be offered again so log onto to www.atomiczombie.com right away! These Aussies know how to be creative and have fun. Cheers! These guys crack me up. A fully functional couch bike on water. "The whole notion of an amphibious tall couch trike is the beer-induced brain child of a Rat Patrol member who goes by the name of Nancy Porker; I am simply the conduit between a fantasticly absurd idea which should never have been done, and something that now exists and is actually practicle to use in the real world." In an ongoing expedition stretching across five months, 3 states and a Canadian province, naturalists Mike and Kate are circumnavigating Lake Superior on foot, hiking as close to the shoreline of the Lake as possible. They will be undertaking not just a scientific expedition but personal sojourn: Throughout the hike, Mike and Kate will be recording important data about the ecology of the shoreline, the people and places they encounter, the streams they cross, and the adventure of a lifestyle as focused nomads. 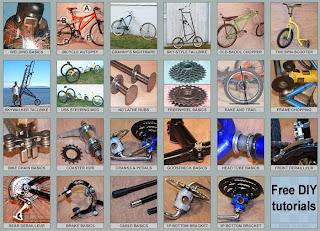 "Hey fellow bike builders out there. Been lurking on your forum for awhile. Got the Kyoto Cruiser Trike plans and want to build a fairing around it to ride and camp as I travel. Weren't you working on some kind of camping bike awhile ago? I remember reading something about that. How far did you get and could you post something about that project, too? Many thanks, Steve, Ohio." Thanks for your question, Steve. We haven't built a fairing yet, but did start working on the Arcturus Human and Solar Powered Motorhome over a year ago. 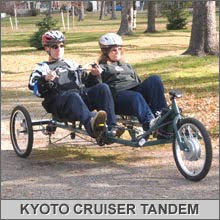 It's based on the Kyoto Cruiser Recumbent Trike, but will have a full fairing and sleeping and eating area. A lightweight velomobile camper with all the amenities you'll need for traveling and camping, including solar powered features. We ran into a problem with lack of space in our garage, so the project has been put on hold until we find a larger place to work on it. Most of the basic frame is already done. But, it takes up alot of space in our garage. We hope to move to a rural location soon to start working on this project again. We have a web site devoted to the Arcturus Human and Solar Powered Motorhome project, so feel free to read through what we accomplished so far. Here's some information from the introduction, but there's also more on the Arcturus site. Thanks for your support and keep us posted on your project in the forum. 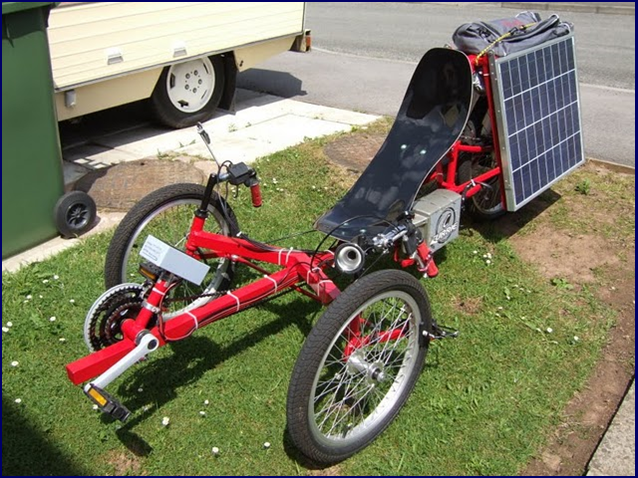 Since the day I began dreaming up bicycle creations, I have always wanted to create a large human powered camper with an electric assist running on batteries that are self charged using solar power. This vehicle would have to be large enough to sleep at least two people and have enough room inside to stand up and move around. Of course, the entire unit would have to be made extremely light for its size and incorporate space age design and materials in order to remain partly human powered. The inside of the camper area will be 4 feet wide, 10 feet long, and 6 feet tall. The cockpit area of the camper will have about the same size as the Kyoto Cruiser, with plenty of room for two riders to sit comfortably without rubbing arms or shoulders. Of course, there will be a main seating area that also pulls out for an additional two-person bed, a large table, storage area, small sink, stove, heater, and built-in LCD screen, all running off of the battery bank. The battery will self-charge using a large solar array mounted on the roof of the camper and via plug-in during cloudy days or between long hilly journeys. This may sound like a lot of equipment, but I plan on a total weight of no more than 400 pounds. Four hundred pounds is 200 pounds of cycle per person, and if you include the power of the electric assist motor, pedaling the vehicle will be as easy as riding any bicycle. Regenerative braking will also be incorporated into the custom computer controlled charging system, motor controller and "smart" assist system, which will instinctively know how much power to split between human and motor for seamless hill climbing and acceleration. Here is a picture of the chopper I recently completed. I built it just for charity / fun rides but I really like it. It's fun. It was great to build just seeing what bits I could weld where, and this is how it turned out. 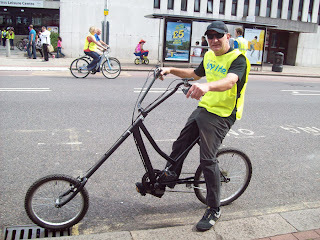 Ken and I are taking our choppers to the Mayor of London's Skyride on the 5th September. So, if there are any AZ krew there give us a wave and say hi! If it is completed on time we might have an Invertabike to play with, too, that we are working on together. I think Ken has the AZ bug, too! It's all good fun. Sweet looking ride, Tim. Love those handlebars! Cheers to you and Ken. "Here's the latest, a special modified Norco trike for my neighbor, Art. 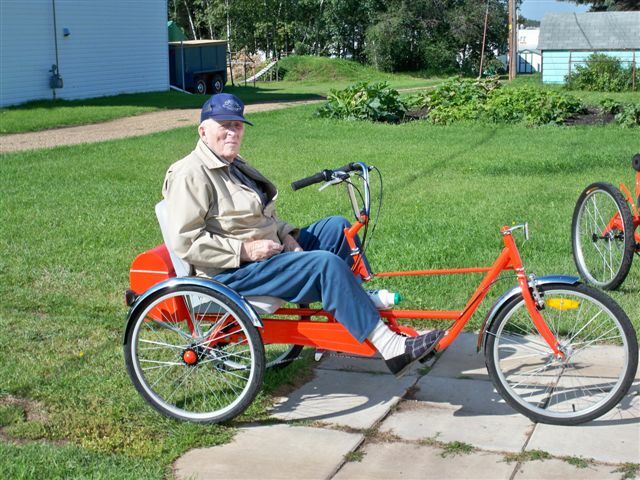 He's never had a bike in his life and he's 94! ~ Roger"
Way to go, Art! Still young at heart at 94 and still smiling. 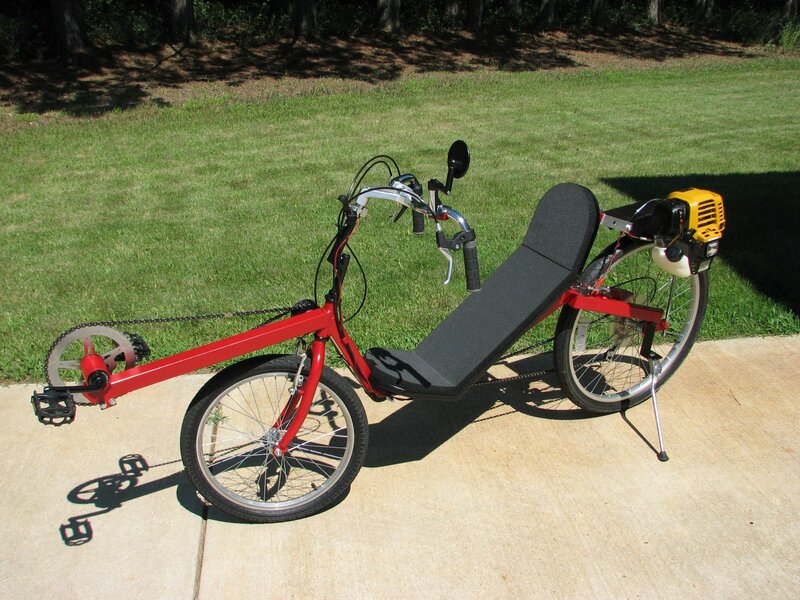 Send us pictures of your completed bikes, velomobiles, trailers, motorized bikes, etc. : gallery@atomiczombie.com . One picture per project, no more than 2MB size .jpg format. Keep up the great work, everybody! Very nice, Butch! Thanks for sending this in for the gallery. The seat is almost identical to the one Brad built on his Tomahawk, too. Enjoy the ride! The building process is designed to allow anyone with a Do-It-Yourself desire to finish his or her own version of the Tomahawk without requiring previous bike building experience or specialized tools and skills. The plan is laid out in a format that makes customization or alternate parts usage a breeze, so you will certainly be able to include your own imagination in the process of building a fast lowracer. 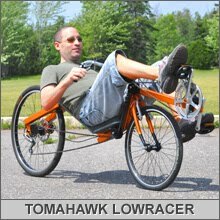 With the adjustable bottom bracket and unique frame design, riders with shorter legs will be able to pilot the Tomahawk without dealing with crank interference with the front wheel. Before you start cutting your frame tubing, it is a good idea to read the entire plan so that you understand how modifications may affect the rest of the build. There is plenty of room for your own design changes, and the Tomahawk can be built using the parts you have available to you. "Hi, I am a retired Electrician from England. Many thanks for your designs, really good. Keep up the good work. Here is my version of the STREETFOX. I have named it SOLARFOX. It has a Currie 200 watt motor and 80 watts of Solar Panels. The panels are hinged and can be positioned at any angle, for recharging the battery when stopped. Top speed on the flat with power alone is 18.5 MPH. My garage has a clear plastic roof so I just park up and set the panels out horizontally to keep the battery charged up. Best regards, Trevor." These are cool! A camper trike that's fully furnished and ready to hit the road. Nice. "German designer Cornelius Cormanns’ ‘Buffalino’ is a fully furnished house on the go. The vehicle is actually a modified version of the three-wheeler ‘Piaggio,’ designed to offer you a comfort ride. Perfect for those solo traveling adventures, the ‘Buffalino’ is decked out with a refrigerator, bed, basin, water tank and even a cooking burner for a homey and comfortable experience. Check out the featured gallery to see the ‘Buffalino’ for yourselves"
Hola mi nombre es Carlos Daniel y vivo en la Argentina, este es mi primer mensaje al foro. Tengo 55 años y estoy construyendo mi guerrero renacuajo. El nombre que tiene es KURURU que es el nombre de la rana en el idioma guarani nativo de mi localidad. Adjunto varias fotografias de la construccion, los caños son de 3,5 cm.,y utilize los v brakes. El peso hasta ahora es de 20 kg. y tiene la primer mano de imprimacion. Espero terminarlo antes de fin de Agosto. Cualquier duda o sugerencia en bien venida. Escribo en español y su traduccion en ingles a traves del Google traductor. Hello my name is Carlos Daniel and I live in Argentina, this is my first message to the forum. 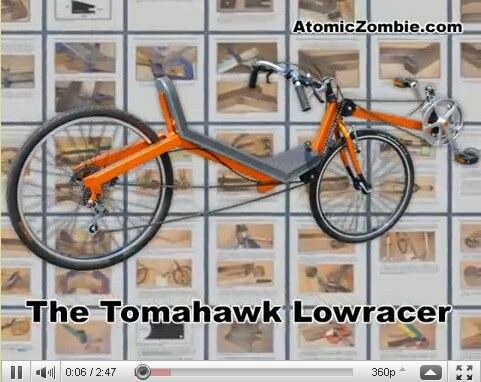 I have 55 years and I'm building my Warrior Tadpole Trike. The name he has is Kururu is the name of the frog in the Guarani language of my native town. AZ Krew Guru, Southend, Essex, U.K. Here is a picture of the bike as it stands more or less at the moment. My wife uses it every day for work. The project has worked out well so far. It rides well and makes my wife's journey to work easier. I have some holiday coming up in a few weeks and plan to install two small panels on a pannier rack I have added since the picture was taken. They will be 12V wired in series to supply 24V to trickle charge the cells during the day, to boost available power for the homeward journey. In the garden I plan to have some larger panels facing south, to plug the bike into in the evening, and to hopefully fully charge over the weekend. The batteries just about last the week on my wife's normal journey, but they are running low on steam by the end of the week for sure, and they take about 3 hours to charge with a 1.5A automatic charger. I think this way I hope that I would rarely need to use mains power for charging if left to charge on the solar panels over the entire weekend. Ideal! I have also installed an LED voltmeter where the steering stem meets the frame, and a key to isolate the batteries. I will let you know how the solar charging performs. It should be operational in October if all goes well. 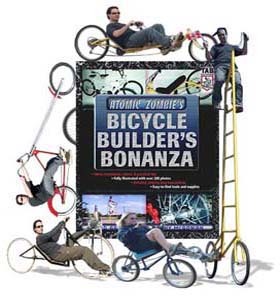 More interesting stuff about you: I would love to see how to build a bike repair stand. The ones that I have built are just that, previous ones that I have built. I have collected bikes from the different town around Gardner, I repair them and give them out to charities also around here. I have been showing some of the bikes that we have built and are planning on signing up for the different parades. Most of the time I enjoy seeing the smiles that appear out of nowhere when some one decides to love a bike again. You can also see it in the bikes themselves. They run a little faster, jump a little higher and just prance a little higher. We have set up an Adoption Program where people can adopt a bike and give it a good home. Since Susan and I adopted our three children and we know how much love we have received, we wanted to share this with others. It's kind of neat. God Bless, Pastor Kurt. That pretty little lady pictured above is my daughter "Madison". 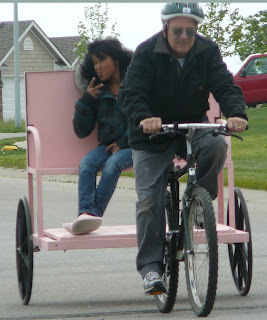 She is riding in "Double Bubble" a pedicab that I built. I'm the good looking guy doing the grunt labor. We have been offering $10.00 bikes on Craigslist through my church "Journey for Life Ministry" and have been overwhelmed with people wanting to get back out on the road riding again. We are rebuilding our web site journeyforlifeministry.org and are going to show pictures of all the people that have adopted our bikes and giving them a better home which also brings smiles to their faces. I enjoy your newsletters and your books. I got both of the bike books and they sit in a prominent place next to the seat in the library, where I have plenty of time to view the pictures. I was able to mount the brackets for the brakes, then realized I needed spacers to keep them from rubbing the top so I have to wait on setting up the brakes until I can go to the store and get some. The first chain-ring/ washer combination did not work, it was missing a tooth which caused the chain to jump off. I was able to make another one that works well. In the process of getting the chain management straight I some how managed to freeze up the freewheel, I will have to take it apart to see if I can fix it, if not I will have to find another one. no pics at this time, maybe tomorrow. OK, I have finished the chain management part of the build. Instead of using a pulley I used an old chain-ring and a washer ground to fit then welded to the inside. I drilled out the center of the washer so the flange bearing will fit. I made the goose-neck a little different than the plans, I am thinking that I could run the cables through the hole at the top of the goose-neck. I kind of like the profile of the goose-neck. I still need to make and mount the brackets for the brakes and the elbow guards then touch up some welds. The weather is starting to get bad so I will have to work on it some other time. I haven't had much time to work on the trike since my last post. I celebrated my 17 year anniversary, SWMBO wanted new chairs for the den and I had to go with her to move them. Anyway here are a couple of pictures of the rear end with the freewheel and disc brakes attached to the axles with the brackets I made. I was able to get the rear end welded to the seat tube, every thing came out square. I also welded the front tube in place you can see in the picture that I clamped a guide tube to the rear end and used that to ensure that it was in line. I cut and notched the front tube and positioned the fork in preparation to welding. I got lucky with the forks, I picked them and a 48 spoke 20 inch rim up for $15 if you look close you can see that it already has the studs for the front brake. I was going to put the front brake on because I wanted more than the one brake called for in the plans. I had only bought one disc brake initially, I got lucky at my LBS where one of the customers there had a pair of Avid B5's that he wasn't using and he knows that I build my own and am always looking for parts at a good price, he sold them to me for $20 . Now I need a new front fork. I built the freewheel adapter out of a left side BB insert and a long 5/8 inch socket that I cut the end off of then I drilled and tapped holes for set screws. I didn't want to weld anything to the axle so everything will have a removable bracket of some kind. I was also able to make a bracket for one of the disc brakes. no pictures, I will take some tomorrow. This OverKill style chopper with that phat rear tire is still popular among so many bike chopper builders. So great to see our OverKill still inspires creativity around the world! This one was built by Greg Pauze of Midland Ontario, Canada. Whoa - that's one phat rear tire! I love the Meridian design. I have built two. It's a fantastic all round bike. Good news that your building again. Keep up the good work. Once you ride it for a while and get comfortable, and confident you will love it for sure. I have had so much fun on mine and it has done all I asked of it. Best bike I ever rode. I ride in forest and enjoy weaving in and out of trees, On the road in and out of traffic and everything in between. It took an hour or two of riding for me to get used to never having ridden a recumbent before. "Permagrin" is a very appropriate term for the Meridian. I enjoy every moment on my Meridian and even when my legs feel like jelly from pushing the fun I still have that grin on my face. Keep us posted. 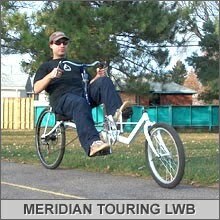 All the very best, Tim"
Because the Meridian is a fusion of a lowracer and a touring recumbent, it's a bicycle for all occasions. It's great for those wanting a stable, easy-to-ride and comfortable bicycle for city commuting or long leisurely rides, but it also jumps into action when you want that all out fast and furious blast around the track or neighborhood. Due to the high seat position, you can look most traffic "in the eyes", so safety in crowded urban traffic is greatly enhanced. The unique over seat steering places your arms in a natural position and feels much like any standard bicycle steering system, so there is no learning curve when riding the Meridian. Since the steering is connected to the front wheel through a linkage system, there is no long flexible gooseneck to deal with and no dangerous "Tiller Effect", which would seriously compromise the handling characteristics. 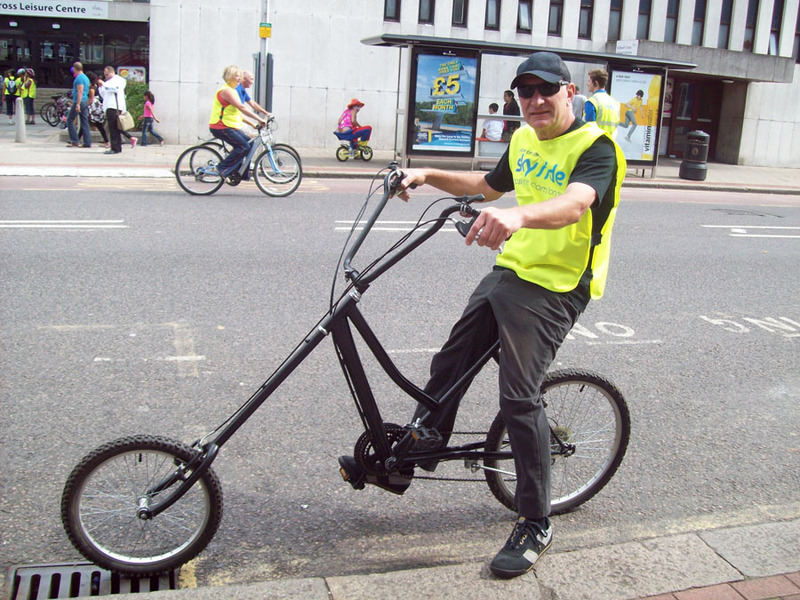 Tiller Effect is a common problem on long wheelbase cycles that places the handlebars close to the rider using an extended gooseneck connected directly to the front forks. Because the gooseneck is placed at an angle, the handlebars tend to swing out from side-to-side when making sharp turns, which can become a real safety issue when dodging obstacles at high speed. For this reason, there is no Tiller Effect in the Meridian design. The cost of building the Meridian is up to the builder, and will be dependant on the quality of components such as brakes, wheels and transmission hardware used. But typically, the bike can be completed for under $100 if you already have a donor bicycle to use as parts for the frame. When completed and painted, the Meridian will look as good or even better than some production "bents", and when you proudly proclaim that you build it in a few weekends, you may find the entire bicycle club lining up at your garage door with spare parts! 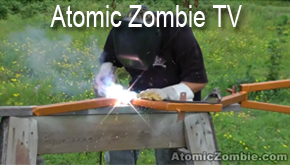 We welcome your pictures and stories for the newsletter and Atomic Zombie blog. Hope to see you in the Builders Forum. The Flying Dutchman Cargo bike brings an entirely new dimension to the Dutch style load carrying bicycle. With dual suspension, a recumbent seating position, and the ability to carry hundreds of pounds, the Flying Dutchman is the king of load carrying two wheelers, able to move practically anything you can fit into the cargo bay. The cargo bay is completely adaptable to just about any type of load you may need to move. The entire building process is designed to allow anyone with a Do-It-Yourself desire to finish the Flying Dutchman Cargo Bike without requiring previous bike building experience or specialized tools and skills. The plan is laid out in a format that makes customization or alternate parts usage possible, so you can create your very own unique load carrying two wheeler from the parts you have on hand. The Flying Dutchman weighs less than a truck spare tire and uses no fuel, yet can move a load as heavy as a refrigerator with very little effort. The bottom bracket is also adjustable to accommodate riders of varying heights and leg lengths. The smooth rolling recumbent design is comfortable for the long haul, stable at most speeds, and allows a good vantage point for busy city usage. Leave that gas guzzler at home and move your cargo under human power alone! Have a look at our Builder's Gallery to see other similar cargo bike examples, including many creative modifications to the plan. Our international builders community ranges from students to retired engineers, but they all have one thing in common - the desire to build their own stuff! Video will be online in a couple of days. Family cargo bike from New Zealand - uber cool!